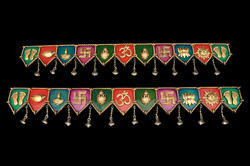 Pioneers in the industry, we offer gls toran with bell, patti toran with bell and chatri toran with bell from India. Wall Hanging Hand Crafted Ganesh, Laxmi & Saraswati Toran With Bell al in Ceramic Crush Material With Wooden Base, Fine Hand Crafted Art Work, Washable Material , Pure Brass Bells With Natural Duco Paint finish. 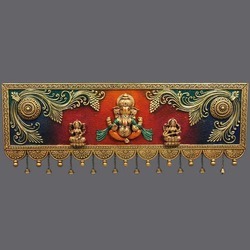 Wall Hanging Hand Crafted Patti Toran With Bell in Ceramic Crush Material With Wooden Base, Fine Hand Crafted Art Work, Washable Material , Pure Brass Bells With Natural Duco Paint finish. 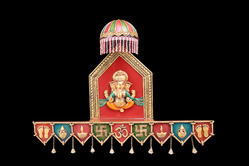 Wall Hanging Hand Crafted Ganesh Chatri Toran With Bell in Ceramic Crush Material With Wooden Base, Fine Hand Crafted Art Work, Washable Material , Pure Brass Bells With Natural Deco Paint finish.